Julian Schnabel’s “The Diving Bell and the Butterfly” luxuriates in its exquisiteness, sky-writing poetry across a big, brazen canvas that only a great artist would dare fill with such shimmering vision. It abolishes sentimentality for worldly wit, spurns bathos for emotional fluency and embraces possibility in the face of unspeakable calamity. It’s a tough-minded weepie that never asks for your tears — though they’re gladly accepted — appealing instead for astonishment at the invincible life force. For a film about a man who is totally paralyzed, save for a single eyelid, “Diving Bell” swoons with the joy of movement. Schnabel insists that his camera, under the sure hand of cinematographer Janusz Kaminski, swerves, glides. He invites sensual immersion, a feast of canted angles, spinning views of sky and ceiling, flower dreamscapes and claustrophobic close-ups. Shots bear the considered composition of fine photography; images toggle between the frightfully expressionistic and soothingly impressionistic. Schnabel, one of the late 20th century’s most important painters, performs lilting ballets with the camera to convey the awakening interior world of his real-life subject, Jean-Dominique Bauby, who in the 1990s was the editor of French Elle magazine before having a major stroke at age 42. The stroke condemned the vivacious Bauby to “locked-in syndrome,” a rare condition that leaves the victim lucid of mind and thought but as physically frozen as a tree trunk. 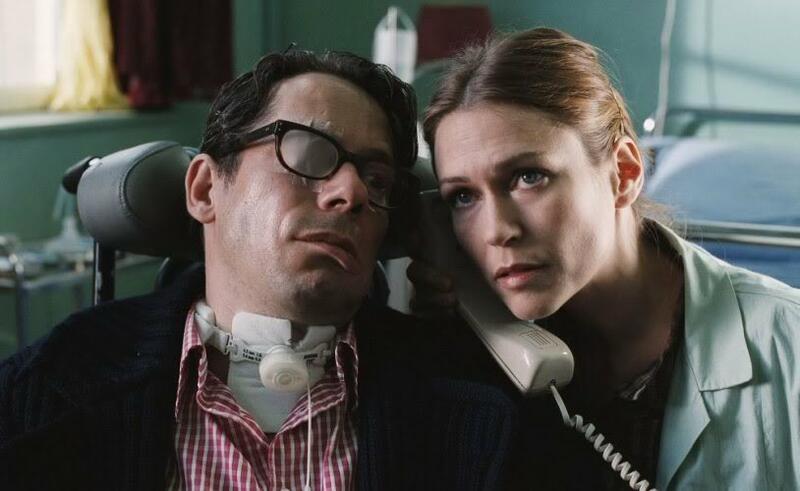 “This is life?” Bauby (Mathieu Amalric) wonders in his spooling internal monologue, for his mouth can no longer shape words. What the film so spectacularly rejoins, and what Bauby soon embraces, is: Yes, this is life. Accept it. Most of all, live it.